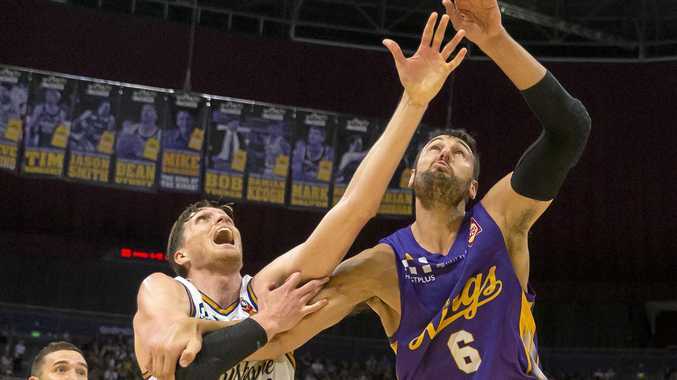 GIANT centre Andrew Bogut continues to make a compelling case for NBL MVP honours in his maiden season, inspiring the Sydney Kings to Saturday's 75-68 win over the Brisbane Bullets in Sydney. Bogut, who won an NBA championship with the Golden State Warriors, was a force at both ends of the court, tallying 14 points, 12 rebounds, five assists and four blocks. Spurred on by a crowd of 9545, the Kings chalked up their 11th win of the season to remain in top spot on the ladder heading into the New Year. Standing 2.13m, Bogut was at his best in crunch time after the Bullets had closed the gap to four. He made two pressure hook-shots with his left hand and underlined his status as the NBL's most feared defender around the basket with a pair of defiant blocks. American playmaker Jerome Randle was instrumental with 14 points, while Kyle Adnam and Daniel Kickert combined for 22 off the bench after captain and two-time NBL MVP Kevin Lisch was held scoreless for reportedly the first time in his career. Sydney's win spoiled Brisbane guard Adam Gibson's milestone 400th game and dropped the Bullets (8-8) into a tie for fifth spot with the Adelaide 36ers. Bogut quickly made his imposing presence felt, racking up six points and six rebounds in the opening period. Randle was also cooking with seven points, as the Kings built a 24-18 quarter-time lead. Sydney pushed the margin out to 11 in the second period, with Bogut, Randle and Brad Newley doing most of the damage. Lamar Patterson's 13 first-half points kept Brisbane within striking distance, but the visitors struggled to create high percentage shots against the Kings' aggressive defence and trailed 45-35 at half-time. Sydney coach Andrew Gaze was concerned when the Bullets drew level midway through the third period. The Kings steadied in the closing minutes and were ahead 62-54 at three-quarter time. The Bullets kept fighting and were still in the hunt late in the final period before Bogut's clutch plays sealed victory. Brisbane have to quickly regroup for their New Year's Eve clash with the Illawarra Hawks (7-9) in Wollongong. Sydney have a week to prepare for next Saturday's meeting with NSW rivals Illawarra, also in Wollongong.